Many journalists fall prey to the vendetta of a cruel and intolerant State. This often results in harassment, and at times, even in death. Lasantha Wickrematunge, an anti-establishment newspaper editor of the Sunday Leader in Sri Lanka was one such journalist. A fierce critic of former president Mahinda Rajapakse, Wickrematunge was assassinated in January 2009 - during the final months of the country's brutal civil war. A big blow to Sri Lankan journalism, the murder caused national and international outrage. His death came just days before he was to testify against Rajapakse's brother defence secretary Gotabaya Rajapaksa, who had been spearheading the battle against LTTE rebels, of taking kickbacks. Rajapaksa and many other members of his family are still under investigation for extensive financial fraud and murder during his 10 years as the head of Sri Lanka, during which 17 journalists were killed. Adding an odd twist, Wickrematunge foresaw his death. In an article published three days after he was shot dead by gunmen on motorcycles while driving to work, he wrote, "When finally I am killed, it will be the government that kills me." 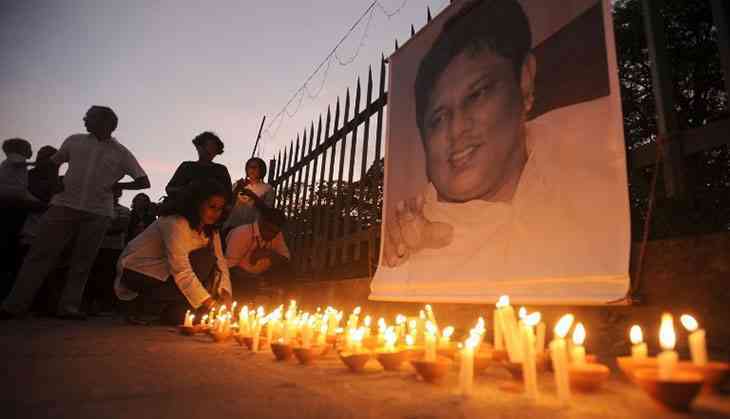 The investigation into his death hit the usual hurdles while Rajapaksa was still in power. Then in 2015, his successor president Maithripala Sirisena promised to find the journalist’s killers. In March 2015, Sirisena appointed a secretary to examine violence against journalists under Rajapaksa’s rule, including Wickrematunge’s murder and the disappearance of Prageeth Eknaligoda, a cartoonist last seen being pushed into a white van in January 2010. Then in 2016, a retired army intelligence officer committed suicide at his home in October. He left a note claiming responsibility for the Wickrematunge’s death. But the police are treating the 'suicide' as a murder too as they do not believe the contents of the suicide note. Wickrematunge’s murder is back in the news as fresh information has come to light as controversial former army chief Sarath Fonseka has alleged that it was Gotabhaya Rajapaksa that hired killers - army commandos - to assassinate Wickrematunga. He also named national Intelligence Chief Kapila Hendawithrana, who stands accused of leading a killer squad. But his testimony has now brought another name forth, of an army intelligence operative - Major Bandara Bulathwatte - who he claims was promoted to the "rank of second secretary at the Sri Lankan embassy in Bangkok just a week before the January 2010 presidential elections". Fonseka had been removed as army chief and had been jailed for corruption and on other charges by the previous regime. In 2015, he was reinstated as an army general and his right to vote was restored. The chief suspect in Lasantha Wickrematunga's assassination was given a diplomatic post by the then defence secretary Gotabhaya Rajapaksa but it was withdrawn soon after Mahinda Rajapaksa won the January 2010 election, fresh evidence has revealed. Rajapaksa has denied any involvement in the January 2009 assassination of Sunday Leader editor Wickrematunga and a string of other attacks against dissident journalists, but new evidence shows he nominated the main suspect as an intelligence officer at the Sri Lanka embassy in Thailand. The then powerful defence secretary has denied allegations by his army commander and erstwhile friend Sarath Fonseka that he led a killer squad comprising handpicked army commandos attached to a secret killer gang. Rajapaksa has countered the allegation saying that if there were any secret killer squads involving army personnel, Fonseka as the then commander should take responsibility. Fonseka in his testimony to the police has said security and intelligence operations in Colombo were carried out by Rajapaksa and national Intelligence Chief Kapila Hendawithrana, who is also accused of leading a killer squad, according to a report filed in the Mount Lavinia courts last month. However, the latest evidence showed that Gotabhaya Rajapaksa nominated army intelligence operative major Bandara Bulathwatte as an “intelligence officer” with the rank of second secretary at the Sri Lankan embassy in Bangkok, just a week before the January 2010 presidential elections. President Rajapaksa was challenged at the polls by his army chief Fonseka who ended up in jail after a controversial court martial and high court proceedings against him. In a hastily prepared letter, Rajapaksa asked the Foreign Secretary to appoint Bulathwatte as an intelligence officer after recalling another officer holding the rank of second secretary in Bangkok. It was done in such haste, even a bio data of Bulathwatte was not attached, although it was requirement for him to get his visa and have the appointment regularised by the foreign ministry. This letter dated January 18, 2010 was issued in Rajapaksa's name and it was authenticated as genuine by the then additional secretary to the defence ministry, Ravi Arunthavanathan. The appointment of major Bulathwatte was made in the heat of a bruising presidential election campaign. Bulathwatte's bio data was obtained from army commander Jagath Jayasuriya. Transfer of public servants cannot be carried out when an election has been called unless with the concurrence of the Elections Commissioner or under urgent national security considerations, but such a requirement was not mentioned in appointing Bulathwatte to Thailand a week before the polls. However, after President Mahinda Rajapaksa was re-elected and Fonseka was arrested, defence secretary Rajapaksa changes his mind and tells the Foreign Secretary to defer Bulathwatte's posting due to national security considerations. "Request please to make necessary arrangements to postpone the scheduled departure of the above officer (Major B.W.D.M.R.P.S.S.B.D Bulathwatte) until further notice as his presence in Colombo is of importance with regard to matters pertaining to national security," said the then chief of National Intelligence Kapila Hendawitharana in a letter to the Foreign Secretary. This letter is sent on February 25, almost a month after the election is won by President Mahinda Rajapaksa. Exactly two weeks after asking the Foreign secretary to hold Bulathwatte's appointment, Hendawitharana gives the go ahead to send Bulathwatte to Thailand. Hendawitharana then makes a U-turn five days later asking the foreign secretary to further postpone the appointment. This time, the reason for the postponement is: "The presence of the officer is urgently required for a very important matter pertaining to the national security." Technical evidence and telephone records have placed Bulathwatte at the location where Lasantha was killed as well as in the places where other journalists were attacked. His six-member gang is now in remand custody and several of them have been identified by those who survived attacks. The vehicle used in some of the attacks as well as Lasantha's killing has been recovered from the home of a woman linked to Bulathwatte, who is now in remand custody. Soon after the former defence secretary's name was mentioned in a court document last month, he denied any involvement and left the island and is said to be in Singapore following a study course. The former military intelligence chief, Hendawitharana, has already been questioned by police in connection with Lasantha's killing, but investigators said several other officers are due to be questioned and high profile arrests are imminent. Two other suspects in the attacks against Lasantha and several others, Warrant Officers R. L. Rajapaksha and I. P. A. Udalagama, had been given clerical jobs at the Sri Lankan embassy in Germany. This piece was first published in Economy Next.